Only Need a Few Stickers, Decals or Labels? Following are a few recommendations if you are looking for a low quantity of stickers, labels or decals. 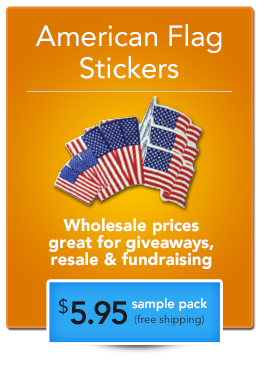 If you are looking for small sized stickers (not small quantities) please look around Websticker as we are the experts on promotional stickers and labels bought at quantities that fit our wholesale production methods. Here are some minimums on our most popular products: outdoor stickers = 125, vinyl cut decals = 50, roll labels = 1000, and we can do as few as 4 on large wall stickers, graphics and car magnets. Outdoor Quality Stickers – Check out Sticker You which has a nice system for doing small runs of digitally printed stickers in any shape or color scheme. For 10% Off use code: SYWebsticker10 You can also check with local sign shops with digital print and cut technology. Vinyl Cut Lettering, Numbering & Vinyl Graphics – You can check with a local sign shop (all of which have plotters) or we do a good deal of work with Speed Graphics. Contact [email protected] for quotes, questions or further info. You can also check out thousands of stock vinyl graphics (to which you can add personalization if needed) at Decal Junky. Paper Labels – For small runs of paper labels you can explore buying pre-cut label sheets from companies such as Avery or On-Line Labels that you can run through your own printer. Or, ask at a local print shop what options they have for printing on their digital copy machines. For more durable food labels you can check other “short run labels” options on-line (there are many) or visit Sticker You. (with discount code: SYWebsticker10). I would still recommend checking out the price on 500 labels from a resource like ez.clickprint as often the cost of small runs can quickly add up to the cost of a bulk run of 500 or 1000. If you have any questions or are in need of any sticker related products, information or recommendations, please don’t hesitate to contact us.